Derek Deprey | Don’t Inadvertently Quit! 05 Jun Don’t Inadvertently Quit! I don’t know where you are right now, but I do know that you probably slept through the night, woke up, and likely checked your email or social media feed. When you noticed this blog post, you decided to click on it. So now what I would like to know is, how long do you think it took me to write this post? When I pose this question to others, most people mistakenly believe that I wake up at 4:30am, brew some coffee, fire up my laptop, start writing, and publish the post by 5:30am. While many readers assume that it takes me about one hour to complete, in reality it takes me about ten hours. I think that writing a quality, share-worthy article takes 90% more time, energy, and effort than most people think. What is something that you do that takes way more time, energy, and effort than most people assume? Why Does It Take Me 10 Hours to Write a “Simple” Article? I could choose to write and publish an article in one hour, but I don’t… because I won’t! Instead, I strive to write impactful pieces. With every possible blog, I ask myself the following 14 questions: (1) Will the idea appeal to my target audience? (2) Is the title clear, concise, and compelling? (3) Does the image or picture relate well to my content? (4) Does the introduction evoke interest? (5) Did I address the readers’ challenges? (6) Did I pause to ask reflection questions for the reader? (7) Should I create a Tweet to emphasize a powerful quote? (8) Did I add some humor? (9) Should I define any key words? (10) Do I need to add supporting data or research? (11) Is there a person I should interview who could add major value and insight to the topic? (12) Should I simplify the material with an infographic? (13) What action will I ask the reader to take? (14) Will the reader be inspired to make a positive change? …And I’m Still Not Done. After simultaneously writing and asking myself all of the questions, I’m only four hours or forty percent done. I still execute the following ten-step process: (1) Send the first draft to Rachel, my wife and initial editor. She’s brutally honest and takes no issue with the delete button. (2) Re-read and make the suggested first edits. (3) Forward the second draft to my mother-in-law, Mary, my final editor. She’s the Grammar Queen and has a knack for reworking some of the wording or content that isn’t quite clear to a reader. She always sends back the edits with the caveat that I can take them or leave them. (4) Re-read and make the suggested final edits. (5) Request approval from the people whose names are mentioned. (6) Publish the blog on my website. (7) Transfer the article to my email marketing platform. (8) Post the link on all of my social media pages. (9) Respond to everyone who emails me back. (10) Engage with everyone who comments on social media. Before I wrote my first blog, I, too, thought that the process would only take me about an hour. 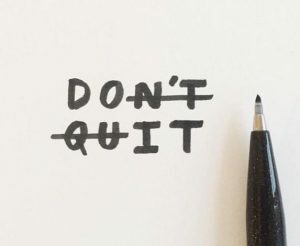 Here’s the point — I was overwhelmed and had inadvertently almost quit altogether, because my expectations were too high, and my time frame was unrealistic. I’m forever thankful that we cancelled our cable TV subscription a month before I published my first article, as I had fewer tempting distractions at my fingertips. Better that I keep plugging along and finish! Think about something that you want to achieve. Do you want to lose weight, earn that coveted promotion, start a business, or learn a new skill? Have you ever wanted to write a book? Are your expectations for this future book set quite high or pretty low? Do you want to write a great book or would you be satisfied with an average one? Assuming that you want to inspire your readers to continue to turn the pages, what would your projected time frame be to reach the finish line? Are you being unrealistic by assuming it would take 3-6 months, or are you being more realistic and realizing that it might take 18-24 months? When I got serious about writing my book, SHIFT, I initially thought it was going to take me 6 months. After 6 months, however, I had barely started the second chapter. I was frustrated. In reality, my book ended up taking me 20 months to publish. Again, I had inadvertently almost quit because my initial time frame was unrealistic. I’d like to think that I’ve been able to be a fairly consistent writer because I have high expectations and realistic time frames. I call this having H-E-A-R-T, which stands for High Expectations And Realistic Time frames. Over time with my own trials and errors, I’ve learned a valuable lesson. If you set high expectations along with unrealistic time frames, you’ll burn out and likely quit every time. On the other hand, if you align high expectations with realistic time frames, you’ll have a much better chance to succeed. It’s an intentional choice. Does Your Team Have H-E-A-R-T? H-E-A-R-T applies to teams, too. Think about a team you’re a part of at work or someplace else. How many times has your team failed to achieve a goal or finish a project because the leader had high expectations, but an unrealistic time frame? I know I’ve been guilty. Not having H-E-A-R-T with collaborative goals and projects creates an unintentional and costly ripple effect of quitting and turnover due to the stress and burnout. Have you ever thought to yourself, “Ugh, I’m I the only person going through this. I can’t handle it. I will never lose weight/start a business/get promoted/write a book/[insert current problem here]. I’m an underachiever. I’m overwhelmed.” What’s the easiest thing to do when you are overwhelmed and under pressure? Quit. Stop unintentionally quitting. You absolutely CAN achieve your desires by having H-E-A-R-T.
ACTION: Think about one significant goal that you’ve wanted to achieve for quite some time, but still haven’t accomplished. Don’t lower your standards. Instead, ask yourself the following question: Has my time frame been realistic or unrealistic? I’m guessing that it has been unrealistic. This time, get real! Triple the time frame that you originally thought it would take so that you don’t feel the urge to quit.